New Collection Features Have Arrived! It’s been just over a year since we introduced Add-on Collections, a way for anyone to create and share groups of add-ons for Firefox. Today we’re very excited to launch a major update to our add-ons gallery that makes it even easier to spot, save, and share your favorite add-ons. Most people use collections to keep track of their favorite add-ons, so we’ve made it one click to favorite an add-on from almost anywhere on the site. You’ll automatically have a private My Favorite Add-ons collection where all of your favorites will be stored. Placing an add-on in any other collection is as easy as favoriting: just click the Add to Collection icon and select its destination. If you want to start a new collection for it, you can do that from anywhere now too! Similarly to add-on listings, it’s now possible to follow, share, and edit collections from anywhere you see them listed in the Collections Directory. We’ve also made the directory navigation easier to understand. With more than 64,000 collections created in the last 14 months, it can be difficult to find a unique URL for a new collection that isn’t already in use. We’ve changed the URL structure so that all of your collections are under your username and can be called anything you want. Existing owners of collections may want to read our Migration FAQ. We hope you enjoy these new features and are working hard on many other improvements over the coming months. If you haven’t explored collections yet, now’s a great time. Great news! Thanks to the Firefox developers. Thanks a lot for the hard work guys. Thanks Mozilla for your existence. Thanks, Firefox Addon’s are it’s main power and Mozilla is doing fine make it more feature-rich. Great to see the new features! 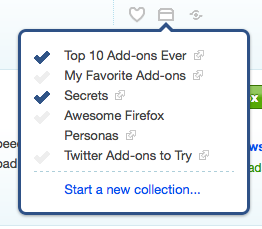 Also waiting for a feature in Firefox to allow a quick setup by way of enabling installation of collections :). Would be awesome to see something like that! Cool news! I love firefox! Awesome features! I’ve been hoping for some sort of site integration for a while and this is just what I was thinking of. Great job, Mozilla! Have you ever heard of a pop filter? I would recommend investing in one for the audio track of your videos. Nice work guys! – The new link structure is way more intuitive. Super! The end of manual management of collections 🙂 Thanks for the hard work. I would also like a feature where the add-ons in the subscribed collection automatically get installed in firefox. This is especially useful when you use multiple pcs across home, office, etc. or when you have to reinstall firefox or your os. not very nice …, Interface social network – evil! Great stuff, guys! Thanks for keeping up the improvements. Appreciate the improvements, but could you please let Addon Collector install ENTIRE collections, instead of having to manually click to install each extension? That would make setting up a new firefox installation much faster. Until then, I’ll continue using the excellent Mozbackup , which backs up the entire installation, history, settings, addon preferences et. al. the collections is not usable now because i cant customize each add-on preferences! Turn up the audio level on these videos. I have the volume controls set to max on all three of my computers trying to hear this crappy sound, so high that system sounds blow out my eardrums. I think you should use this feature to clean out “clutter” add-ons. Besides not having a single .xpi or trying to integrate more of FEBE’s functions in a user friendly web service interface, I think the most problematic hurdle to collections is the problem of having repeat add-ons when searching different collections. You could use the favorite option to take a cue from Gmail’s recently release Priority Inbox and allow for add-ons inside favorited collections to not show up when searching for add-ons in other non-favorited collections. This would eliminate most of the collections containing Ad-Block, NoScript, DownthemAll in the beginning of the collection and hopefully reveal to collection searchers the type of rare add-ons hidden beneath each collection.